Presenting You… Our New 1000-Video Gallery! I have fantastic news to tell you! Not only have we redesigned all the graphics of our community, but we also added a brand NEW Piano gallery with over 1,000 videos. Yes! 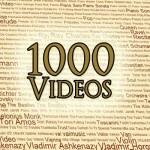 You’ve heard it loud and clear… ONE THOUSAND videos!!! Rod : Thanks everyone for the wonderful comments! Enjoy learning piano! 😀 Cheers!